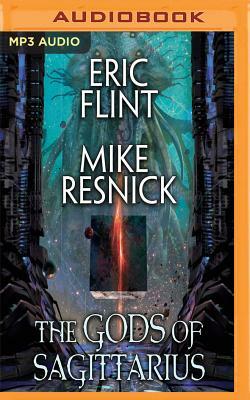 A grand alternate history, science fiction adventure from multiple New York Times best-selling author Eric Flint, creator of the Ring of Fire alternate history series, the Jao Empire series, and the Boundary series, and multiple Hugo award winner and science fiction legend Mike Resnick. Russ Tabor is one of the top security specialists in the galaxy. Much against his will, he finds himself assigned to provide protection for Rupert Medawar Narayan Shenoy - "Lord Shenoy," as he likes to style himself - who is probably the human race's most brilliant savant. Shenoy has become convinced that the race of ancient aliens known as the Old Ones possessed powers unknown to any modern intelligent species. He believes they had harnessed forces which may well have been actual magic, giving the Old Ones the stature of gods. Off Russ and Shenoy go to find the secret. Meanwhile, Occo, a member of the alien race known as the Nac Zhe Anglan, returns to her religious creed's home cloister to find that it has been completely destroyed - and by means which suggest that the Old Ones were the perpetrators. Yet the Old Ones, those ancient and inimical gods of the galaxy, were thought to have perished eons before. Occo is not a savant of any kind. She is a shaman castigant, a warrior of her creed. Her purpose now is to seek revenge, not to uncover the secrets of the Old Ones. But she cannot do the one without first doing the other. So, she and her familiar Bresk set ought to track down those long-gone deities. Now human adventures and an alien shaman are on a collision course with the truth: despite their many differences, only if they unite their forces do they stand any chance of surviving the coming encounter with the gods of Sagittarius.